Rich, dynamic Argentinean cuisine has more to offer than the excellent—but perhaps oversold—parrilla steakhouses on Buenos Aires street corners. Step off the street and into a hands-on cooking class to learn how to make local favorites, including chipa bread, empanadas, beef stew, and dulce de leche cookies. When the cooking is over, enjoy your creations over mate or wine. Mariana was our chef and teacher. She was fun and very informative. Class was in her apartment which was super cute. Very hands on. I would definitely keep taking cooking classes while traveling. The cooks, Julia and Mariana, were delightful and gave good advice. They allowed a lot of hands on and answered questions. Only reason its not a 5 is the blandness or Argentinian food. Chipa bread:was great and easy too. Empanadas were fun, but I'm not fond of corn. I think we will make these with other filling often. Beef stew is where I need more seasoning. Adding apple was a great twist. Cookies with dulce de leche can become addictive. 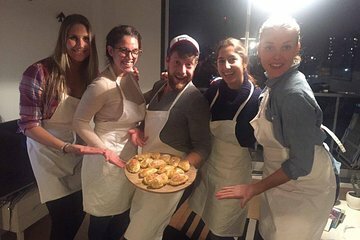 I definitely recommend this cooking class if you're coming to Buenos Aires! Julia and Anna were knowledgeable, friendly and made sure our group had fun while learning to make some delicious dishes. This was well worth the cost and we'd definitely do it again on a return trip.